Many members of the military get out of the service and find a new job earning about what they made in the military. But, then they realize that there are more things to consider than just your base pay and housing allowance when comparing salaries between the two jobs. Thirty percent of your paycheck, on average, is set aside for you in the form of benefits without you ever really thinking about it. So, for a brand new Second Lieutenant who earns $43,860 in 2009 including $1,000 in monthly housing allowance and base salary, up to an approximate $13,000 is also set aside for benefits by the government. So, in essence, he or she is actually earning $56,800 in total compensation, and that is the number that needs to be considered when comparing military and civilian jobs. For members of the military, the distinction is even more dramatic since the government covers all healthcare, a robust college education stipend, 30 days paid leave per year, and a generous pension plan after just twenty years of vesting. 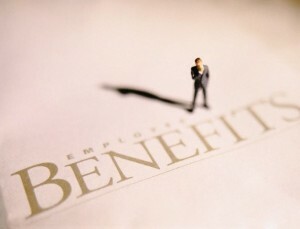 According to the Bureau of Labor Statistics, 11% of your salary is typically set aside for health insurance benefits. Eight percent is paid in addition to what you see in your paycheck for Social Security, Medicare, and other government insurance programs. Retirement plans and pension contributions by the employer generally account for 6% of your salary. The equivalent of 7% of your total compensation is paid to you in terms of vacation, sick leave, and other personal days. Other interesting benefits can add up to between 1% to 10% in things like stock options, company cars, gym memberships, lunch, coffee, etc. In the United States Army, the service offers $4,500 worth of tuition assistance per year for Soldiers to earn college credits in pursuit of a degree. I always considered this free month and a pay cut if you do not take advantage of this compensation benefit. Another big benefit for members of the military are the free gyms on the military bases. If you normally spend $40 per month on a gym membership, this increases your annual salary by $480 per year since it is free to members of the military and their families. These are just a few of the excellent benefits that the military provides its service members, and they must be considered when comparing jobs. You should look at total compensation when considering a new job, and this is especially true for members of the military who are considering leaving the service in search of a comparable civilian job. If you do not consider total compensation, you may end up with a higher salary but actually make less in the end because your benefits are lower. Many people only focus on the salary portion of a job’s compensation and forget to look at the total figure and benefits.